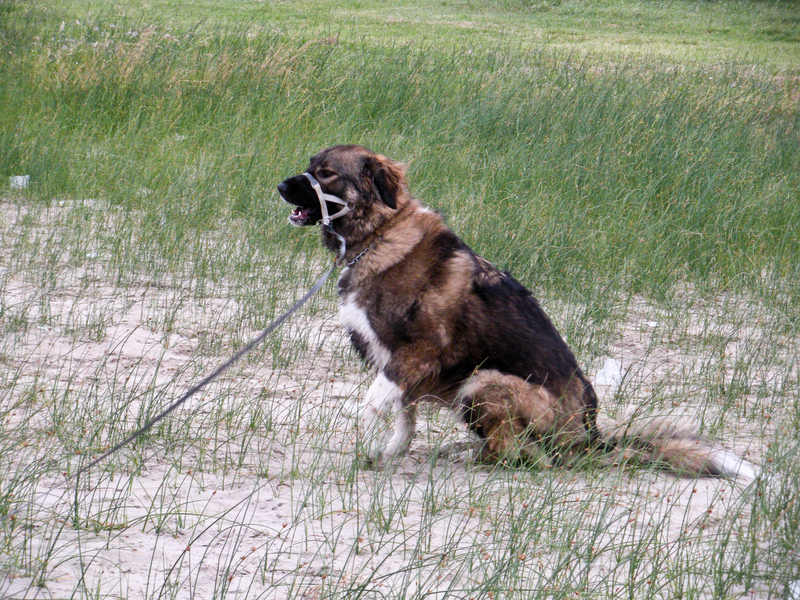 Mattie resting in the saltgrass after going across the causeway. 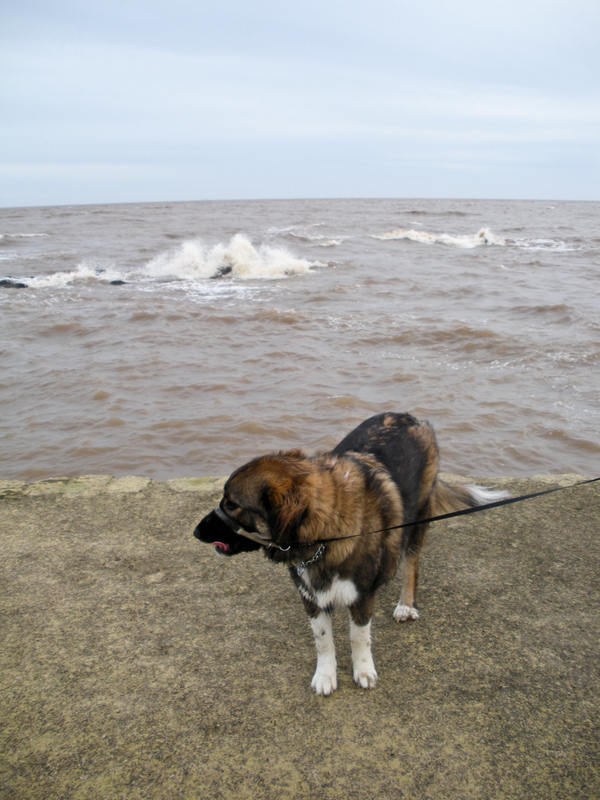 She even likes sitting and contemplating the waves from here. 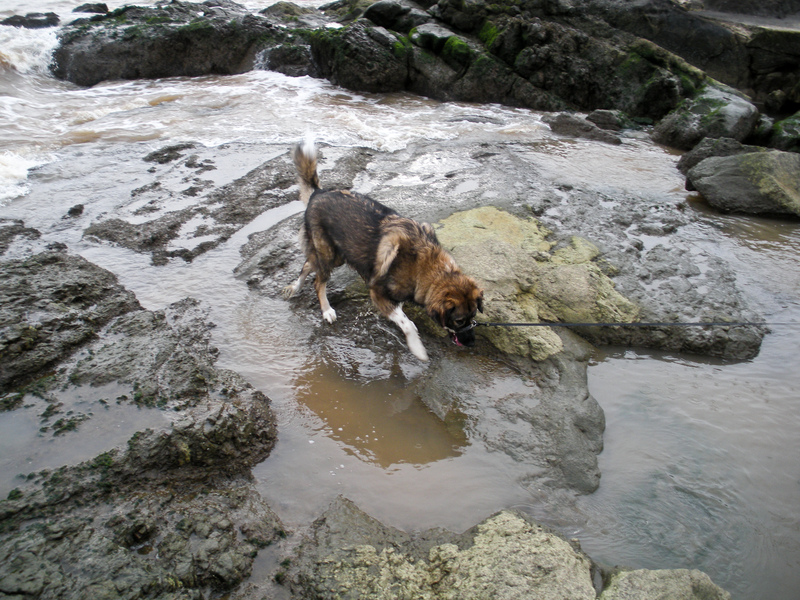 Mattie walking happily and confidently on the slippery rocks. 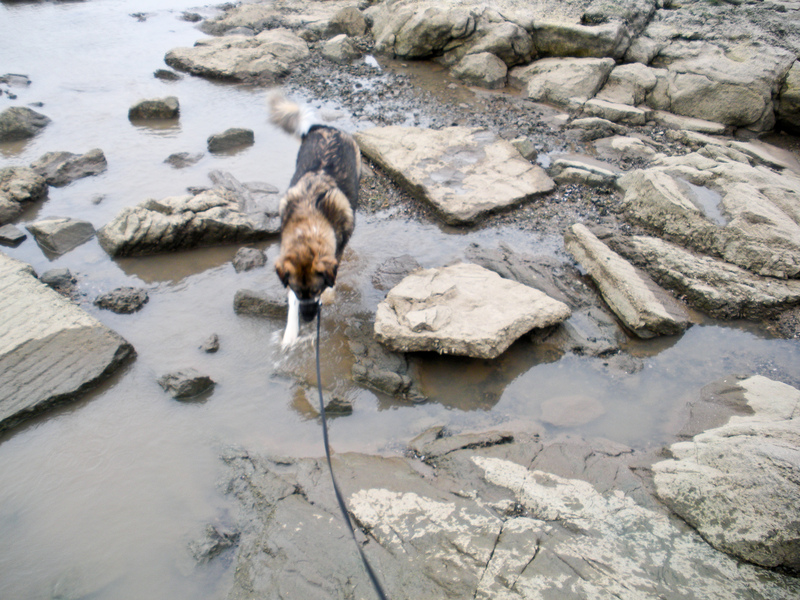 Mattie’s gotten a lot less timid about things like rocks and rickety bridges since her hip’s healed. 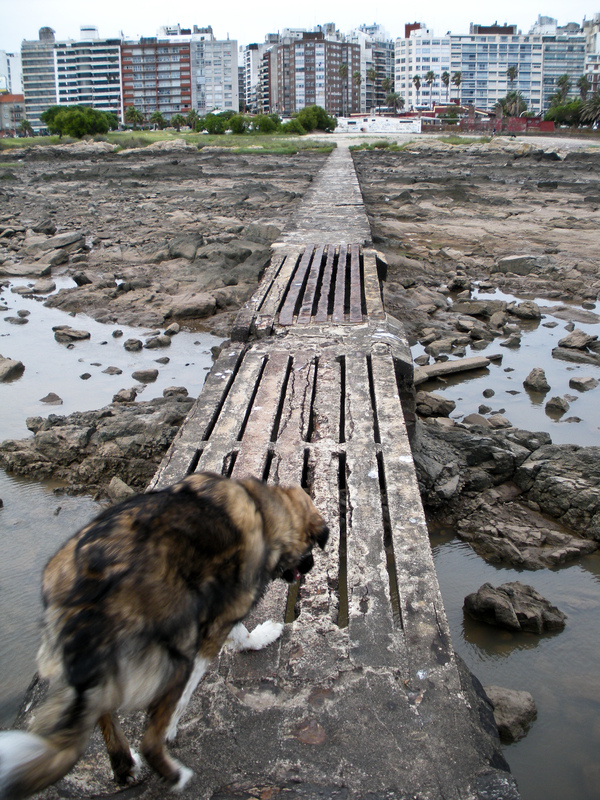 She insisted on going across these rocks, and she bravely crosses this bridge with rusting I-beams. 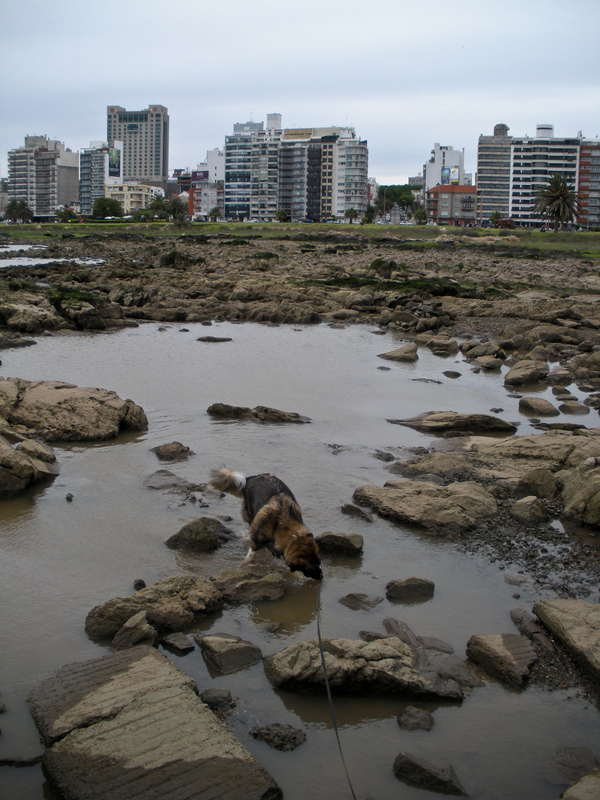 More of Mattie and the skyline, and then a close up of Mattie exploring a tide pool. She gets upset if we walk anywhere near water and isn’t allowed in. 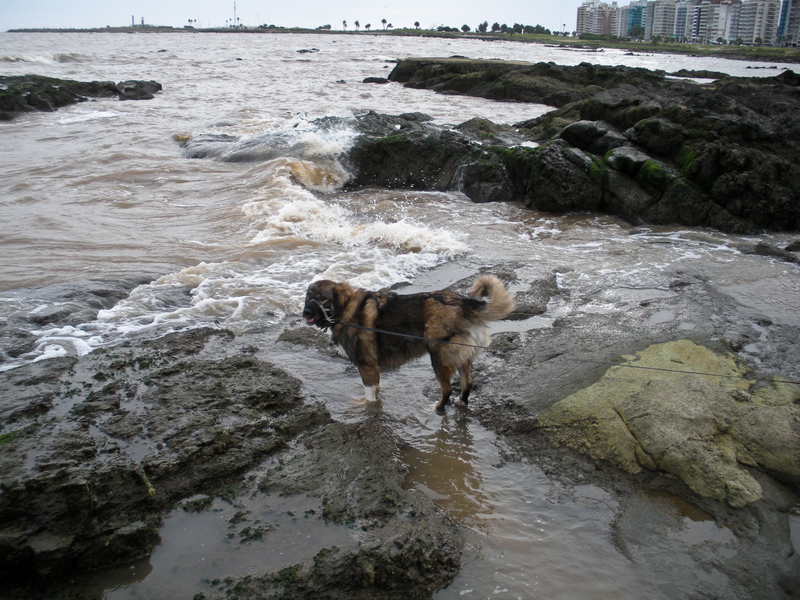 These are Mattie in the area behind the seawall, tramping in the water. It’s also a good view of the apartment blocks overlooking the sea. 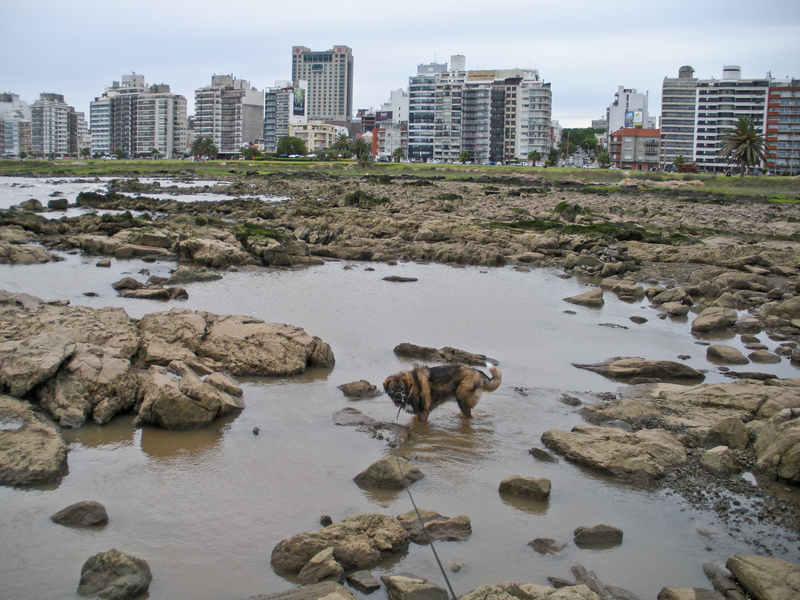 This peninsula is called Punta Carretas, and we live a few blocks inland from the buildings. 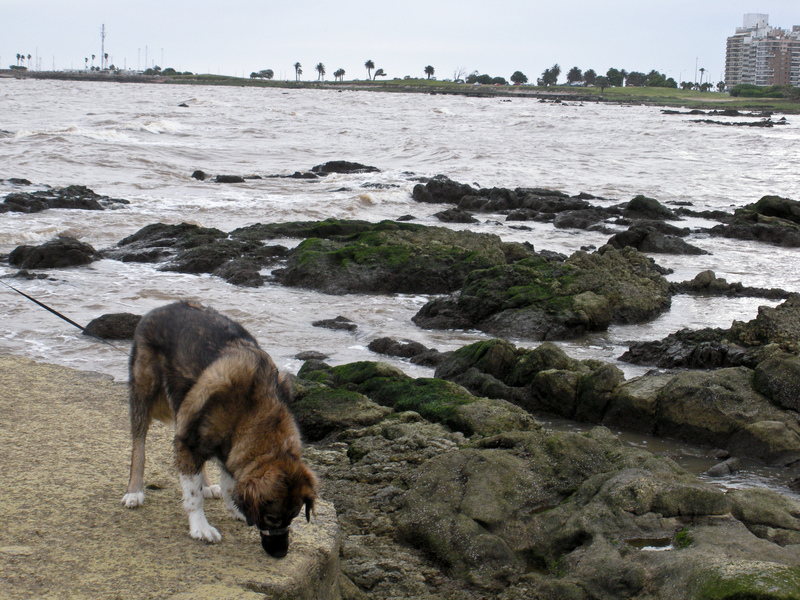 From the not-quite sunny shores of Rio de la Plata, Mattie wishes you a Merry Christmas! She had one- she got presents and spoiled with leftovers. I know it looks like the sea, but it’s still technically the Rio de la Plata, the widest river in the world. 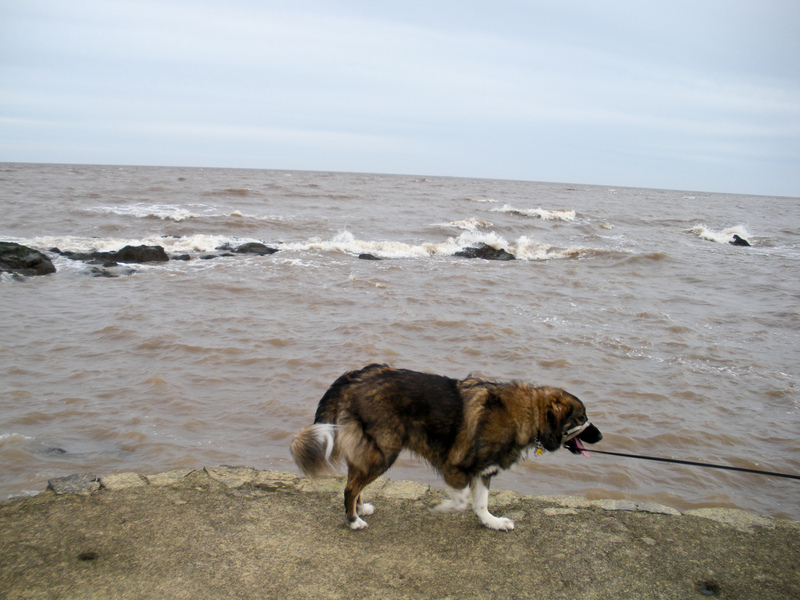 The water’s brackish and smells of the sea. 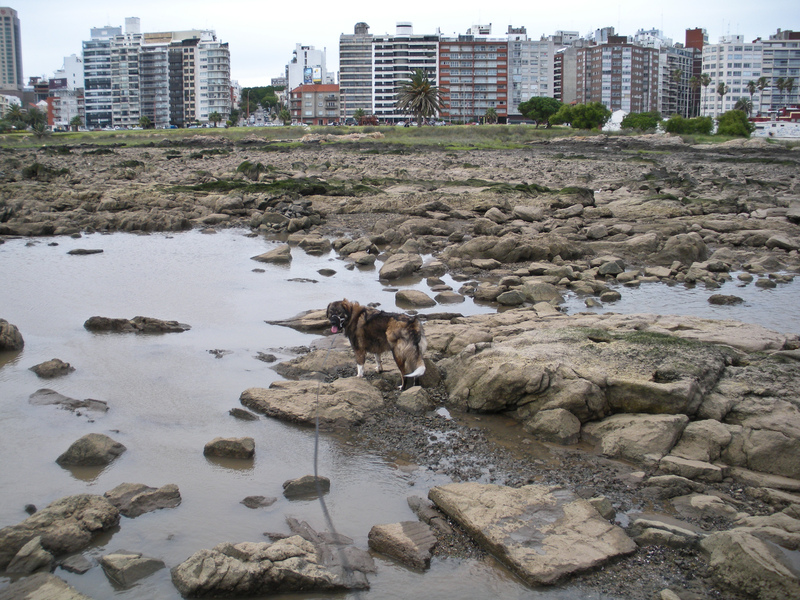 In this top picture, you can see across the cove to another part of the Rambla. On the bottom one, it looks like Mattie’s alone with the sea. She loves the water so much. 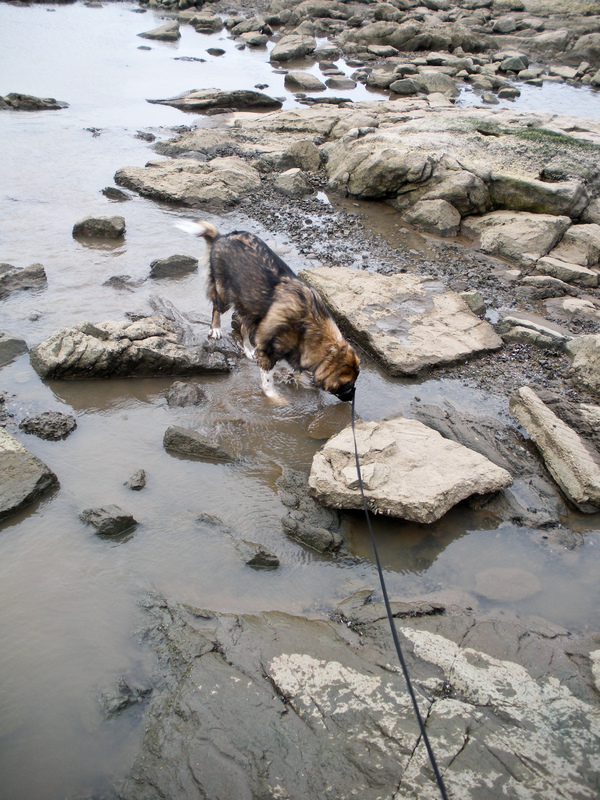 Fearlessly tramping through the tidewater, Mattie exhibits how much better her hip is. 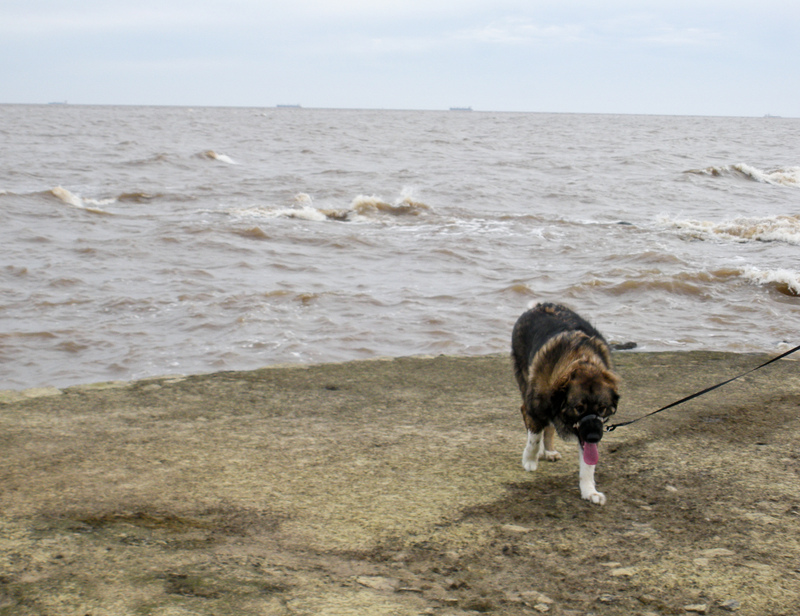 And below, she goes over the seawall to get to another place to get wet. She finally got in the water. Naturally, she loved it. She’s getting a lot better about navigating the rocks.